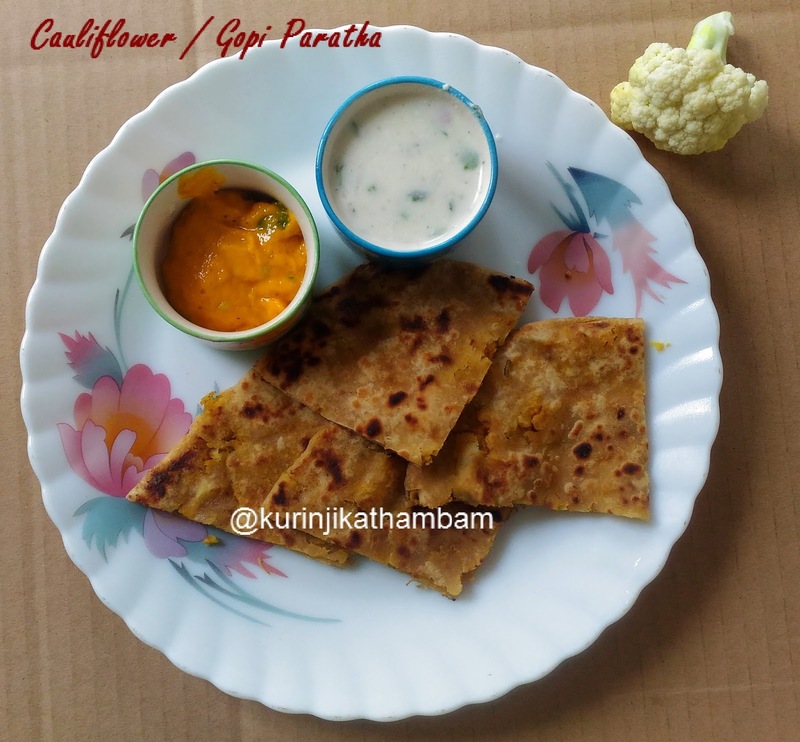 Cauliflower paratha is part of my earlier paratha series. The main advantage of this recipe is that it can make even though who don’t like to eat cauliflower also have it happily. 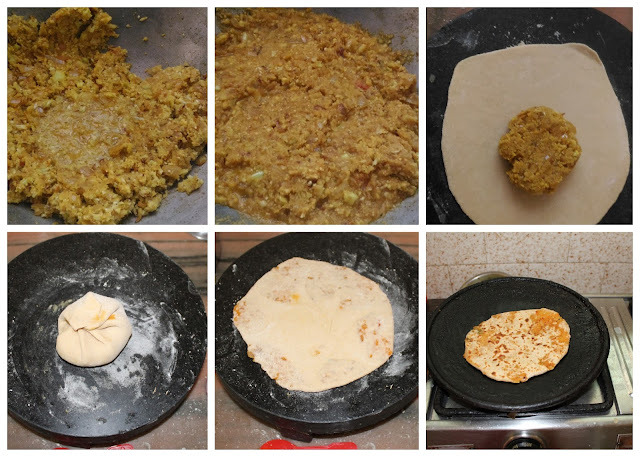 Preparation Time: 10 mins | Cooking Time: 20 mins | Yields: 6-7 nos. 2. Chop the cauliflower into small size florets. 3. Heat 4 cups of water, then add turmeric powder and salt. Mix them well and add the cauliflower florets. Leave it for 5 mins. 4. Drain the water completely and wash them twice with normal water. 5. Grate the cauliflower using the small grater or grind them into a coarse paste using the mixie jar. 6. Remove the skin of the onion and chop it into small pieces. 7. 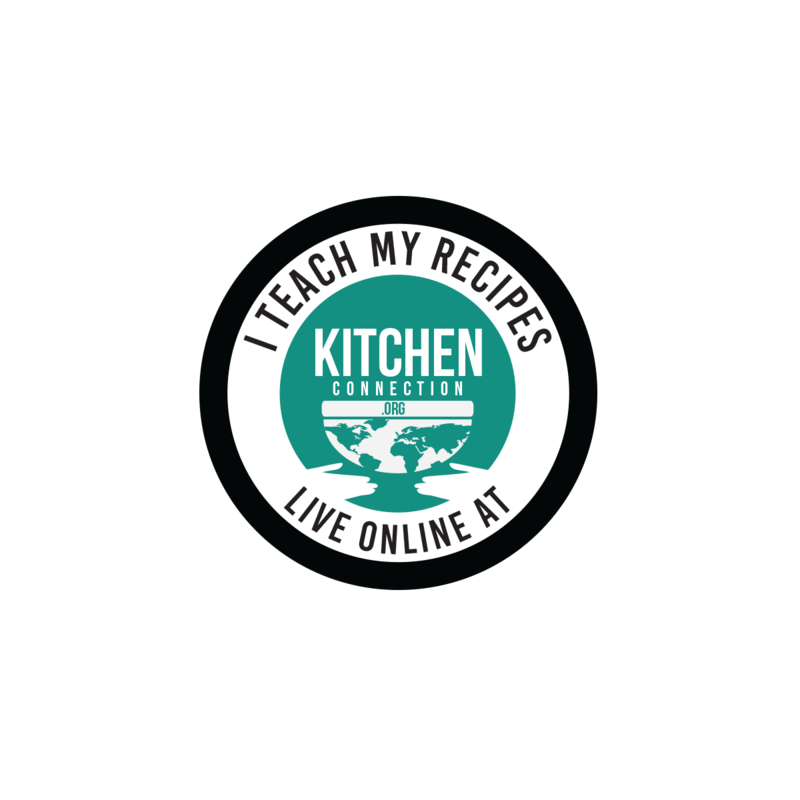 Wash and make puree from 2 tomatoes using mixie jar. 8. Heat 1 tbsp of oil in a thick bottom pan, add cumin seeds and wait forpopping. 9. Add chopped onion and fry till the onion becomes translucent. 10. Add tomato puree and sauté till the raw smell goes off. 11. Add turmeric powder, red chilli powder, garam masala powder, amchur powder and salt. 12. Mix them well and sauté for few seconds. 13. Add Grated cauliflower (from 5) and sauté for 2 mins. 14. Add ¼ cup of water and mix them well. 15. 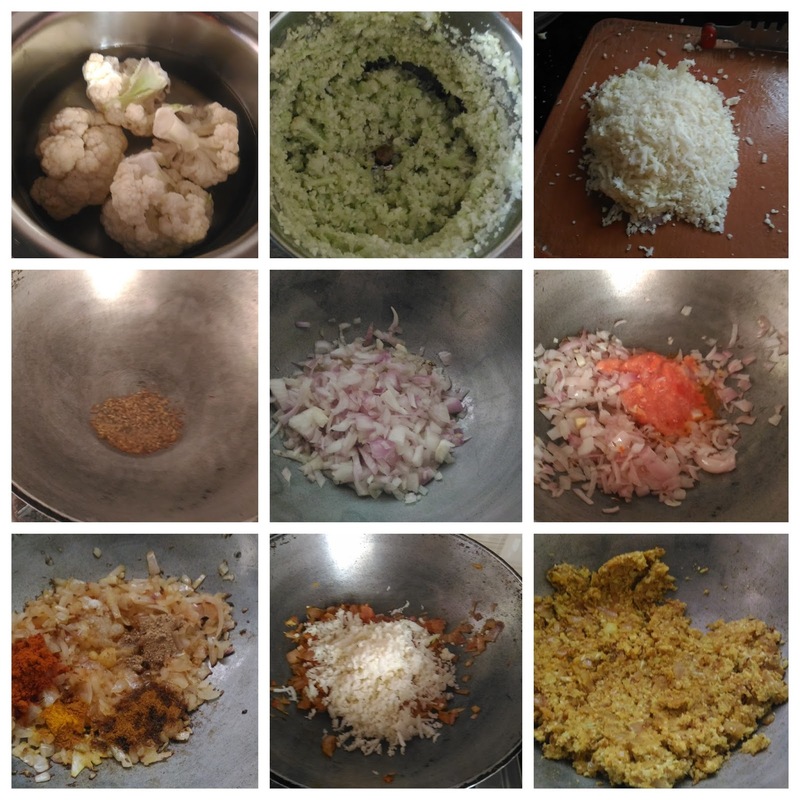 Close the lid of the pan and cook till the cauliflower becomes tender and water absorbs completely. 16. Allow the cauliflower mixture into cool down completely and keep it aside. 17. Make lemon size balls from the cauliflower mixture. But the stuffing ball should be smaller than dough ball. 18. Now divide the dough (from 1) into a lemon size balls. Now dust the dough ball and roll it into a small circle. Keep the stuffed ball in its center. Then bring the edges to the center. 19. Press them gently, again dust the stuffed balls and roll it carefully. 20. Heat the tawa and transfer the paratha, sprinkle the oil and cook both sides till the black spots starts. Mouthwatering and tasty paraths are ready to serve. Serve with Mango Mojito or Raitha ot Pickle. 1. Adjust the spice level according to your taste. 2. Amchur powder is optional. If you don’t have amchur powder, add lemon juice at the end. 3. Adjust the onion level according to your taste.